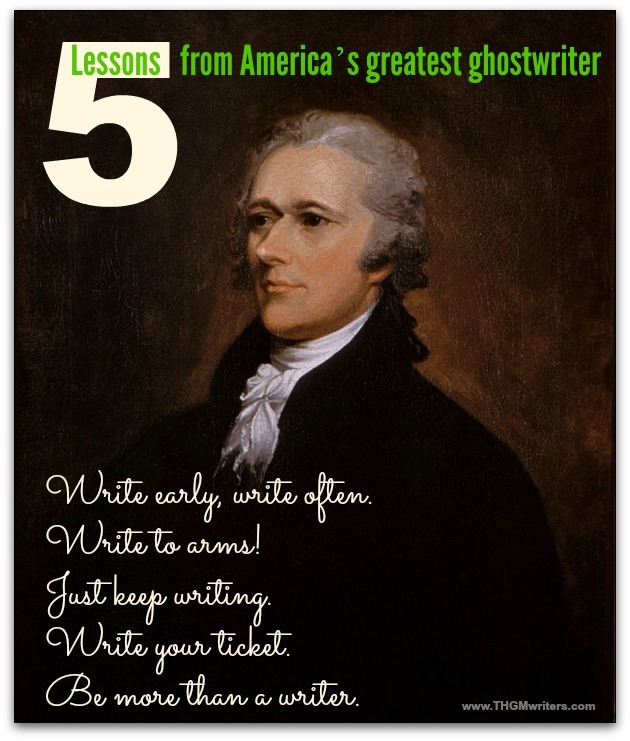 Alexander Hamilton was America’s greatest ghostwriter. Here are five lessons he leaves us, with quotes from the musical that bears his name. Lin-Manuel Miranda is a genius of a writer, taking the fairly base form of entertainment that hip-hop is and elevating it to artistic grandeur. Hamilton: An American Musical contains layers of meaning, and pulls people into the story of America’s greatest ghostwriter. What? You thought Hamilton was a banker? Or a politician? Or a lawyer? Well, yes, yes and yes. But he was also a ghostwriter. For several years, George Washington relied on him to ghostwrite most of his letters and speeches. Let’s take a look at some of the references from Lin-Manuel’s script that offer lessons for today’s budding writers. Writing lesson #1: Write early, write often. Write and write well. Write whatever comes to mind. The more you write and the better you write, the more doors will open for you. Then a hurricane came, and devastation reigned. Our man saw his future drip, dripping down the drain. Put a pencil to his temple, connected it to his brain. And he wrote his first refrain, a testament to his pain. Took up a collection just to send him to the mainland. Hamilton wrote that famous letter to his friend Edward Stevens, then at Kings College in New York City. That letter ended up being published, impressing enough people that some locals sponsored Hamilton’s education, which ended up being at King’s College. By writing early, Hamilton literally wrote his meal ticket and became a scholar. Writing lesson #2: Write to arms! Your pen is your weapon. Use it to win whatever battle or war you’re fighting. Hamilton’s a host unto himself. As long as he can hold a pen, he’s a threat. His enemies recognized Hamilton’s chief strength. Washington might have taken his popularity and gone home, but Hamilton remained with his quill. And his quill was still a dangerous weapon. Writing lesson #3: Just keep writing. Write and write and keep on writing. You are a writer, so keep writing. Write what you see. Write what you feel. Write whatever comes to you. That’s what writers do. Ev’ry day you fight, like you’re running out of time? Why do you write like it’s going out of style? I try to make sense of your thousands of pages of writings. You really do write like you’re running out of time. Writing lesson #4: Write your ticket. Your words have power to win people over. Your writing is your strength, so use it to achieve what you want. You can win people’s minds and their hearts with the words you use and with how you assemble them. Your words can change the world. You and your words flooded my senses. Your sentences left me defenseless. You built me palaces out of paragraphs. One stroke and you’ve consumed my waking days. Writing lesson #5: Be more than a writer. Be not just a writer. Be many things, so that you will have much to write about. Let’s finish with Hamilton’s own words. Well, Lin-Manuel’s attribution of what he supposes Hamilton might have said. But it fits with the rest of the play. Words are powerful. The pen is mightier than the sword. And Hamilton just kept writing. To call Hamilton anything would be to diminish his importance. Yes, he was a writer. But he was also a founding father and the founder of the American monetary system and the Coast Guard and the New York Post and the first planned industrial city in the New World, Paterson, New Jersey. He also founded the New York Manumission Society (for freeing the slaves). Yes, he wrote the bulk of the Federalist Papers, but it was not just because he was a writer. He was also a scholar. He was also a statesman. He was also a thinker and a Patriot. And that’s why he could write them. Wow, if Alexander Hamilton was alive today he’d be busy!!! Not only can you write often but you can publish everywhere! His analysis is probably truer than ever. I’ve followed the advise and am talking less today. [ Smiles ] Those are really some impressive writing lessons to make note off. Alexander Hamilton was a man who possessed a brilliant mind!